gosh I actually can't believe james and I have been here for nearly a year and I still haven't gotten around to showing you our home! I wanted to do a home tour as I adore seeing inside peoples houses (nosey parker that I am) and I wanted to share something a little more personal.. well more personal than what I've been wearing and what colour nail polish I'm loving! luckily the biggest work was done before my tenant moved in (the house was previously owned by an old lady who hadn't renovated for decades! we had to overhaul everything from removing 6 layers of wallpaper in every room to rewiring electrics and installing central heating, plus we built an extension on the bathroom which was teeny tiny) however we did have an unholy amount of painting and floor sanding to do before we could move our things in..! 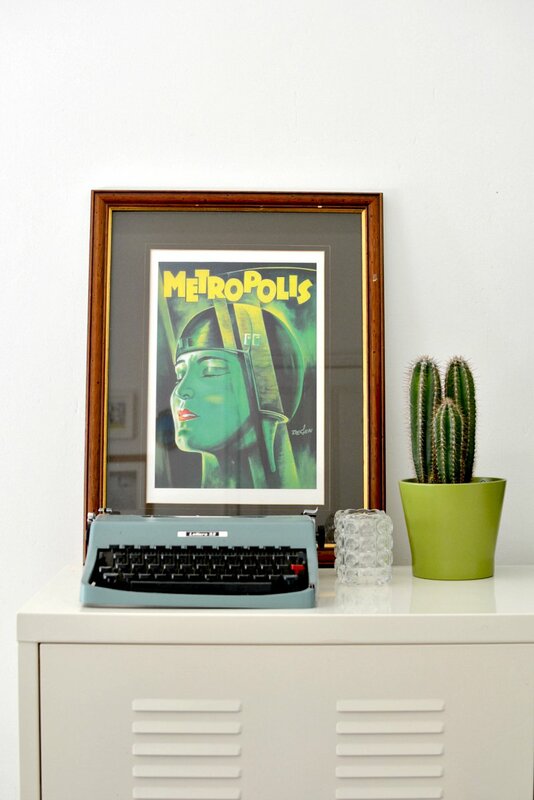 vintage typewriter, photo frame and movie poster | thrifted. 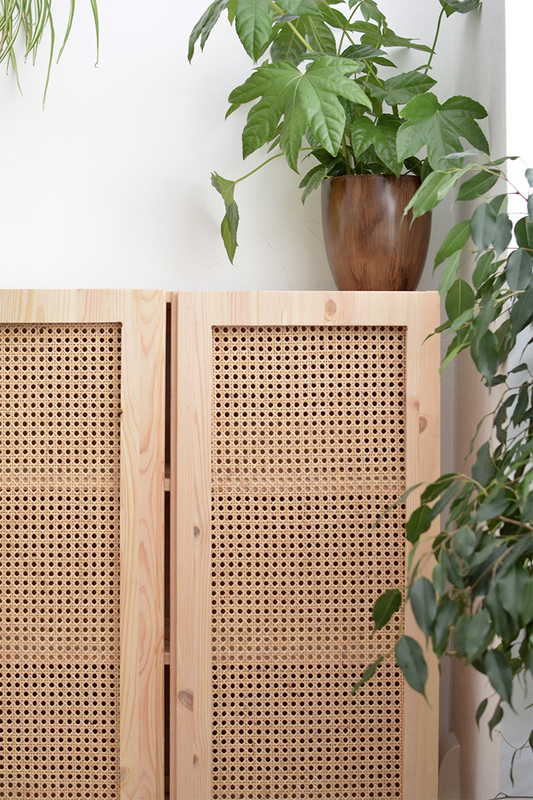 cacti, tealight holders, cabinet | ikea. 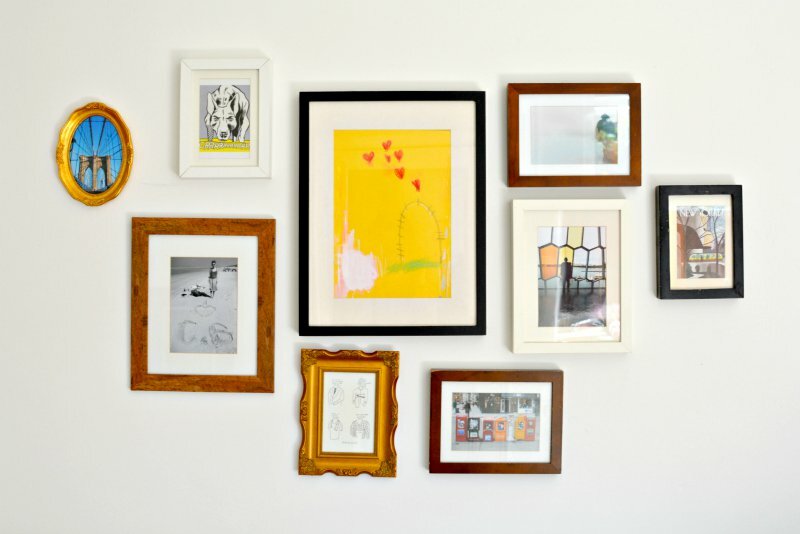 assorted frames | ikea, wilkos, john lewis. the house is painted white.. yup every single room top to bottom. before we started sanding and staining floors we ripped out the old skirting boards which were a mixture of brightly coloured gloss paint (not exactly my style!) I love colour but I also have a thing for white cube spaces (I blame art school) so the only colour comes only from paintings and accessories. the old skirting boards were quite damaged and i wanted to finish the room off so some new white skirting boards were called for. you may not know but old houses are an absolute nightmare when it comes to walls not being quite straight so skirting hides a multitude of gaps and nightmares when laying down floors! 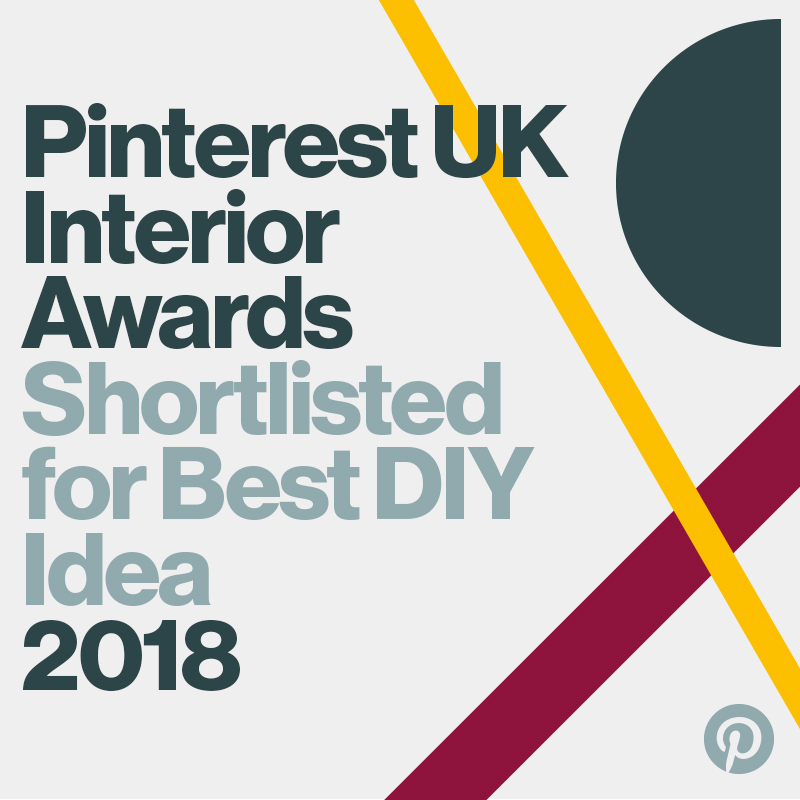 as I've grown older my taste has switched to more scandinavian inspired interiors (luckily for james) so white walls and skirting boards and dark floors are my go to backdrop. the house itself is victorian, I don't think I could ever live in anything new as they just don't have the character I'm so attached to. I loved that this house had the original sash windows and floors (as well as walls that fall apart whenever I drill into them) but the quirks of old houses are what gives them personality. something I never really mention on my blog is that I'm an artist by trade, it's something that doesn't tend to cross over onto burkatron but this is one of my older paintings above, there's lots of them we still need to hang around the house but we never seem to have enough time to finish everything! whenever I go shopping I seem to come home with an armload of picture frames so we have lots of little collections of them hanging. 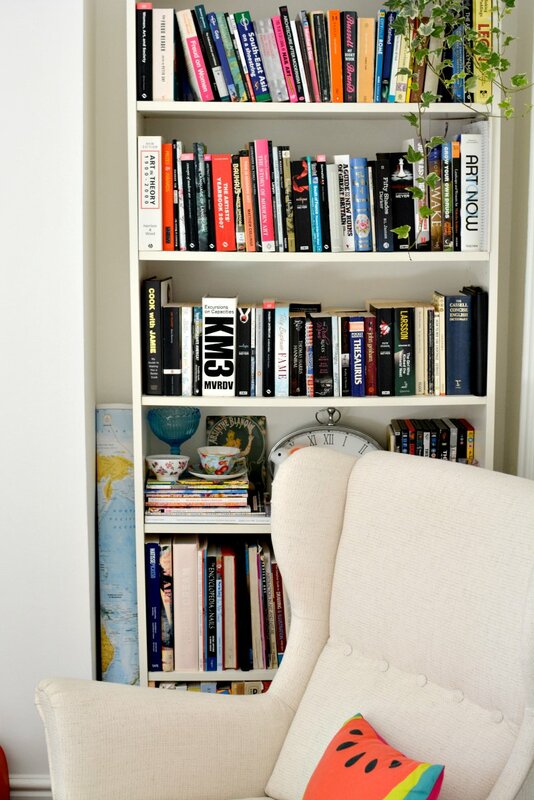 they're mostly filled with holidays snaps, postcards and some of my sketches, we also have a lot of books so storage for these was a must (behind that chair is the door to our under stairs storage.. I'm a bit of a hoarder so this big cupboard is a life saver!!) there's no real theme in our home, we don't really try to match colours or styles we just move things around until we find a happy balance. a lot of the furniture you can see is from ikea (aka the mothership) the rest is reclaimed or found in charity shops as I wanted to mix up old and new pieces in our home. james also brought in some lovely pieces from this nan which are scattered around. our living room is in the middle of the house which means it gets the least light but on the upside it makes for the cosiest room in the evening when we're snuggled up on the sofa! when we first moved in we bought a huge sofa, it soon became apparent that other people needed seating so we eventually bought some armchairs! we didn't have many 'big' pieces of furniture at first but after a month or two we quickly reached a stage where we needed to think twice before we bought anything new (it's scary how quickly you can fill up a house) I guess this is good for my bank balance as interior shopping is way more addictive than clothes shopping in my book! james and I have really similar tastes so decorating the house together was super easy. bickering over me buying (yet) more cushions and james leaving (yet) more wet towels around the house is another matter... ! there's so much I'd still like to do with our home though; the garden is a work in progress as is out third bedroom which holds most of our 'don't know where to put this' pieces of furniture. I think as autumn is getting closer we'll put the garden on hold and finish off the spare room so we finally have a guest bedroom, fingers crossed.. I hope you like this little glimpse into my home, it's hard to capture everything on camera without a wide angle lens but I hope you got a feel for it at least? I'm thinking of showing you some other rooms; my office/dressing room and our bedroom as well so please let me know if you'd like to see more! Very very nicely and aesthetically done! Big inspiration for me! 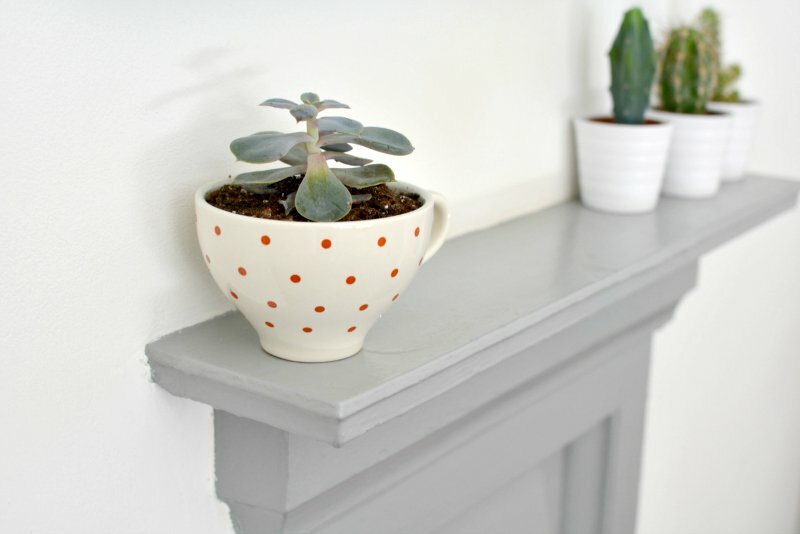 I'm obsessed with your tea cup succulent! 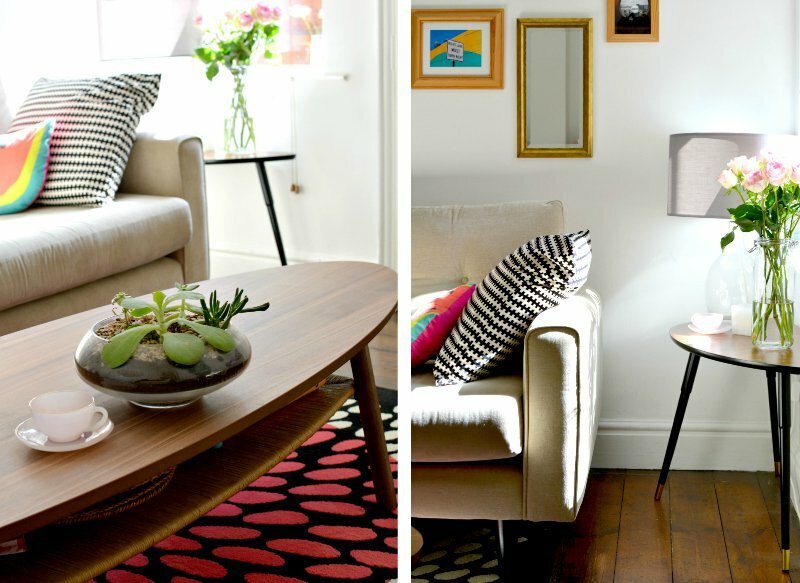 Your home looks lovely Caroline, I love that it's full of colour which I think comes across as your personality. You're always so vibrant and friendly! :) It's beautiful! Wish you a comfy and nice Sunday night;)! You have such a lovely living room, couldn't agree more with you regarding the love of Victorian homes! I love your decorating style! 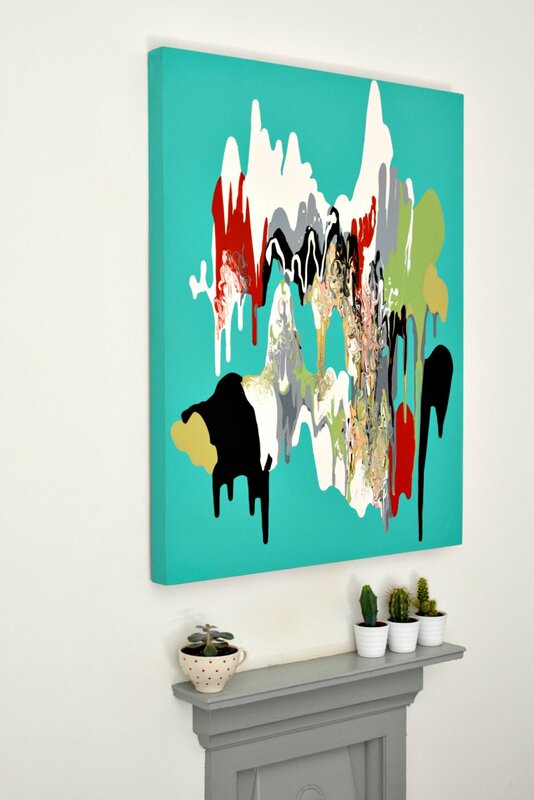 And really, really love the painting above your fireplace! It's gorgeous! 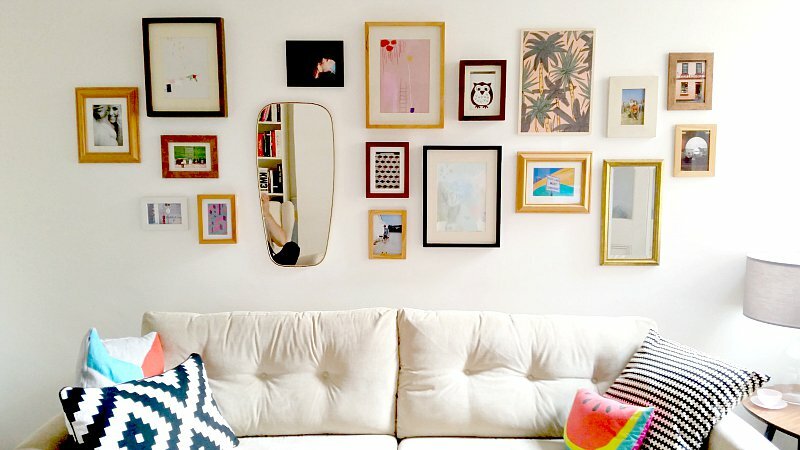 Beautiful home :) I love your blog and I have followed you with Bloglovin and GFC, if you ever get a chance to check out my blog I would be delighted, thanks! This is such a beautiful space. You have amazing taste. This is so cute! 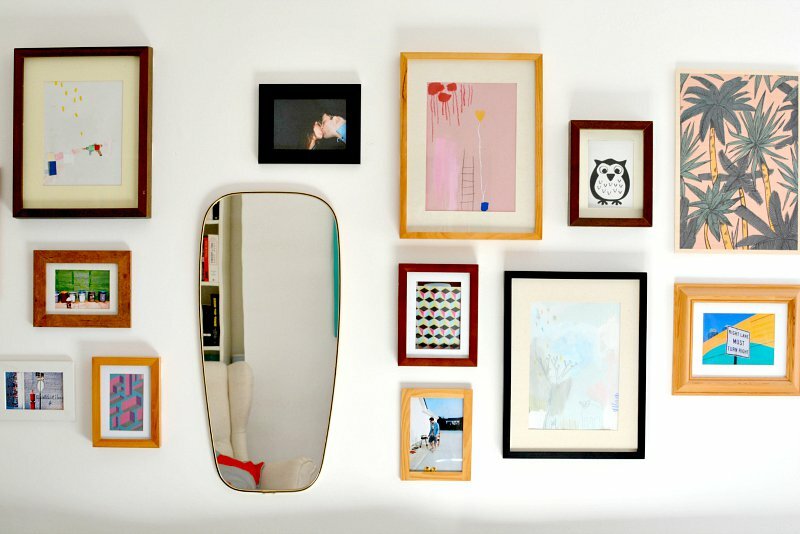 Love all of the frames and the cactus plants! Your floors are amazing and nice to see another cacti advocate! Such a beautiful home! It's so modern and quirky, love it! 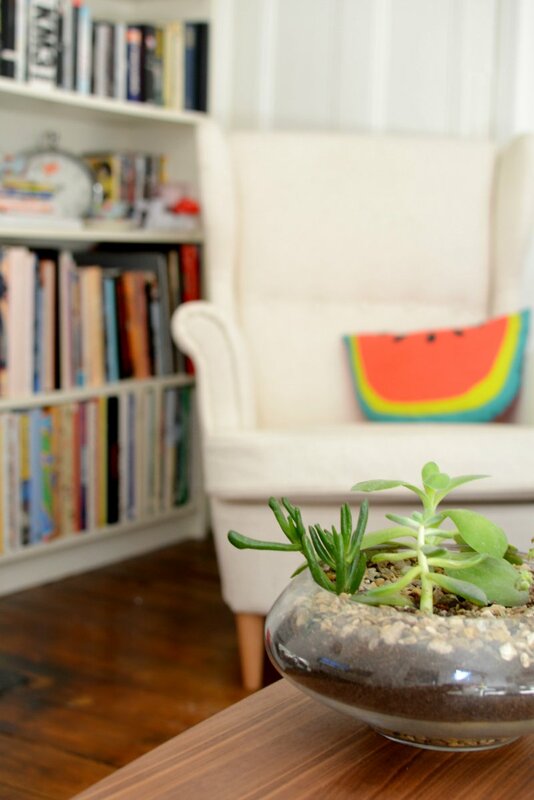 Very beautiful home, these succulents are so cute, love that tea cup.